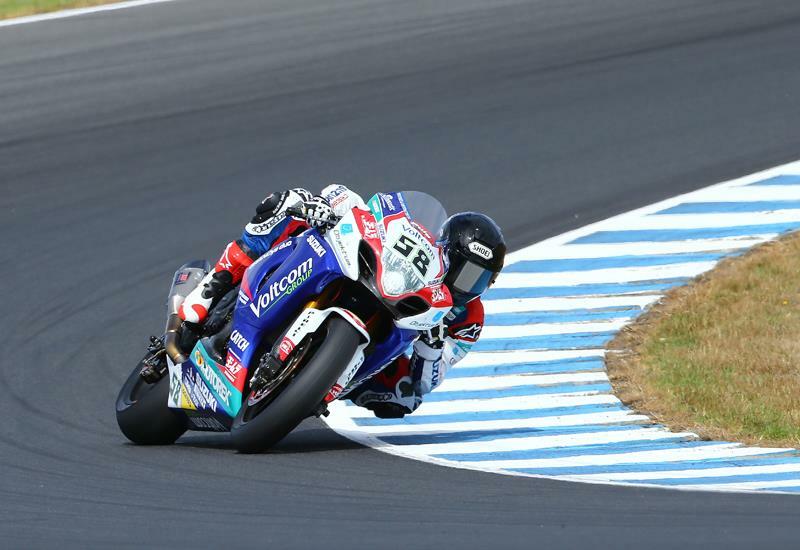 The first of two days of official testing at the Phillip Island circuit saw the Voltcom Suzuki of Eugene Laverty lead the field at a pace that shocked even the fastest rider on show himself. “This morning was probably the best conditions I have ever rode Phillip Island in and that is why the lap times were so good.” said Laverty, who set a lap time of 1’30.513, which was close to the absolute WSB track best, and well under the current lap record. “My aim this morning was a few seconds off of what we did. We had not planned on going as fast as that but conditions were perfect and the tyres were similar to last year so I know what they are capable of. I did 31.1 with two laps to go in the race last year so I know what that tyre is capable of round here. It was nice to get what we need from the bike. I have come on board with a bunch of guys and the bike needed some work, so we spoke in detail after November and they have just given us exactly what we requested. It was a big task and no easy job because they had to rewrite everything I had asked for. They delivered in that short space of time so it shows that they were listening and had faith in me. After a red flag with 30 minutes to go a final last few minutes of the restarted afternoon session saw the top order change behind Laverty, despite the higher temperatures. Davide Giugliano was second quickest on his Ducati works bike, with Tom Sykes (Kawasaki Racing Team) third and his team-mate Loris Baz fourth, despite a big highside in the morning. Alex Lowes (Voltcom Suzuki) was a day one faller, but he recovered well to go fifth in his first ever visit to the Phillip Island circuit, amazing many of the seasoned onlookers. There is more to come from him as he still has to work out the ideal line around the fast turns 11 and 12. Opening day times were blistering considering that the existing lap record at PI is a 1’31.168, set by Eugene Laverty in race two on a works Aprilia last year. The circuit best lap is 1’30.234, set by Carlos Checa in Superpole 2013 on a Ducati, and that involved qualifying tyres after days of testing and practice. This was the first real test on the gap between the full SBK machines and the new-for-2014 SBK Evo bikes and to no-one’s surprise it saw the best Superbikes dominate, although the slowest of the truly top SBK machines was less than half a second quicker than the fastest of the Evo machines. Niccolo Canepa (Althea Ducati) was the best of the Evo riders, 11th overall on day one, and only a few tenths from the full Ducati Superbike of Chaz Davies. Sylvain Barrier (BMW Motorrad Italia Superbike Team) and Michel Fabrizio (Iron Brain Kawasaki SBK) each crashed and underwent x-rays for suspected pelvic injuries, with no further news available at this time. It was a tough intro to world racing for the EBR Buell team, with both Geoff May and Aaron Yates’ machines suffering engine failures of an unspecified kind. The team opted to make investigations on the issue before allowing the riders back out on track, so they missed the afternoon session. Kenan Sofuoglu (Mahi Racing Team India Kawasaki) was fastest of the WSS riders with a 1’33.521. Michael van der Mark (Pata Honda) went second fastest and the MV Agusta RC-Yakhnich Motorsports F3 of Vladimir Leonov took him to third. Jack Kennedy (CIA Insurance Honda) was fourth on day one but fell at turn two, and was taken to Epworth Hospital in Richmond for checks on a suspected broken right ankle.